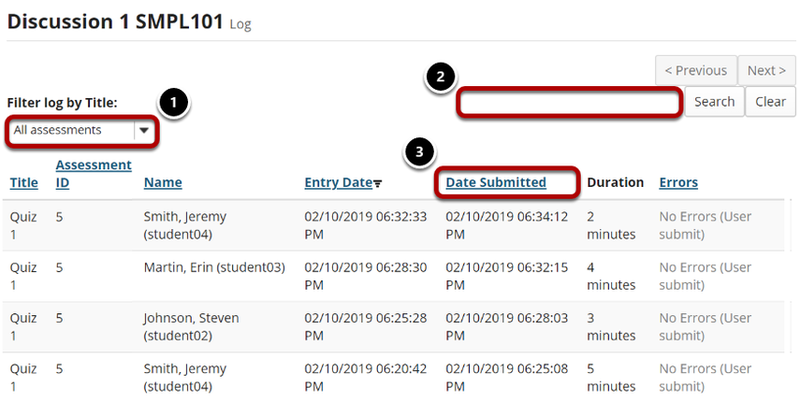 Sakai Community DocumentationSakai 19 User Guide (English) Tests and QuizzesWhat is the Tests & Quizzes Event Log? The Event Log shows certain student activities for all Tests & Quizzes in the site. It is created and maintained automatically. Events recorded include (for each participant), entry to the assessment (date and time), submission of the assessment (date and time), duration of the student session in minutes, errors (if any) detected by the T&Q system, and IP address of the submitter. Note: There must be existing student submissions in order for data to appear in the event log. To view data for a certain test or quiz, use the "Filter" menu to choose its title, or use the default value, "All assessments." You can also search the log data for a certain student by entering the user ID or name in the search field. Click on a column heading (Title, Name, Entry Date, Date Submitted, IP Address) to sort the entries on that data field. Click again to switch between ascending and descending order. Prev: How do I view statistics about a completed assessment? Next: What is the Tests & Quizzes User Activity Report?